Item 145 "You MUST NOT drive on or over a pavement...."
Item 243 "DO NOT stop or park where you would stop cyclists' use of cycle facilities...."
Crewe's first every cyclists breakfast was with around 40 cyclists and concerned local residents, calling in en route to work. We had folk in their eighties who remembered cycling along West Street before the war, and those in their 20s who got to see all the short cuts on the draft map of routes. With the announcement of a further £1.5 million for cycling in the Crewe area, the timing was perfect, and we were able to share attendee's ideas with Sustrans, JMP, Cheshire East planners and Active Crewe Travel. Perhaps most useful was the fact that council officers and Councillors were on hand to listen before spending the government funding. Mornflakes did the event proud with breakfast served on arrival. Of real encouragement were the many supportive comments for the work of CC-Cycles and the cycle reuse activities at St Paul’s Centre. It was a privilege to spend time with people passionate about our town of Crewe and the challenges we face as commuter cyclists travelling to and from work. One of our guests was local author Godfrey Barlow, whose book entitled ‘Unsurpassed*’ chronicles the amazing story of Tommy Godwin. 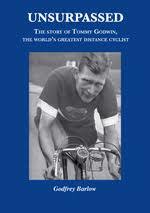 Sixty years ago, Tommy had a single vision, to set an unbreakable cycling record. With courage, passion, and dedication, he turned his vision into reality. Our vision is for Crewe to become a cycling town once more. Have we got the Tommy spirit? Inspired by the book, two Crewe cyclists vowed to repeat a typical Tommy Godwin ride. Tommy had digs in Apsley, about 30 miles north of London near Hemel Hempstead. He clocked up many miles between there and his family home in Stoke. Ben Wye and Rob Wykes will attempt this journey very shortly. They said "Tommy did the journey in 1940, when he was half our age, so we thought it would be fair if we did it at half the speed!" The route will go via Coventry and Milton Keynes, avoiding the busier A roads that Tommy would have used in the days of less traffic. Watch this space to see if they make it! We worked with CTC to double the number of cycle racks on Crewe station, and outside on Pedley Street car park. So now there's plenty of room, and no excuse not to cycle to the train! To mark Bike Week, ACT is supporting schools to learn about safer and healthier travel. The fire service is now responsible for road safety training and has specifically asked for cycle awareness. About 300 ten year olds are due to take part on the 26th June.